Virtual camera system demo showing parameters of the camera that can be adjusted. In 3D video games, a virtual camera system aims at controlling a camera or a set of cameras to display a view of a 3D virtual world. Camera systems are used in videogames where their purpose is to show the action at the best possible angle; more generally, they are used in 3D virtual worlds when a third person view is required. In video games, "third-person" refers to a graphical perspective rendered from a fixed distance behind and slightly above the player character. This viewpoint allows players to see a more strongly characterized avatar, and is most common in action games and action adventure games. Games with this perspective often make use of positional audio, where the volume of ambient sounds varies depending on the position of the avatar. There are primarily three types of third-person camera systems: the "fixed camera systems" in which the camera positions are set during the game creation; the "tracking camera systems" in which the camera simply follows the player's character; and the "interactive camera systems" that are under the player's control. Selection of shots in Resident Evil 2 that aim at creating tension. In this kind of system, the developers set the properties of the camera, such as its position, orientation or field of view, during the game creation. The camera views will not change dynamically, so the same place will always be shown under the same set of views. An early example of this kind of camera system can be seen in Alone in the Dark. While the characters are in 3D, the background on which they evolve has been pre-rendered. The early Resident Evil games are notable examples of games that use fixed cameras. The God of War series of video games is also known for this technique. One advantage of this camera system is that it allows the game designers to use the language of film. Indeed, like filmmakers, they have the possibility to create a mood through camerawork and careful selection of shots. Games that use this kind of technique are often praised for their cinematic qualities. As the name says, a tracking camera follows the characters from behind. The player does not control the camera in any way - he/she cannot for example rotate it or move it to a different position. This type of camera system was very common in early 3D games such as Crash Bandicoot or Tomb Raider since it is very simple to implement. However, there are a number of issues with it. In particular, if the current view is not suitable (either because it is occluded by an object, or because it is not showing what the player is interested in), it cannot be changed since the player does not control the camera. Sometimes this viewpoint causes difficulty when a character turns or stands face out against a wall. The camera may jerk or end up in awkward positions. Instead of staying behind Mario, the camera intelligently rotates to show the path (Super Mario 64). This type of camera system is an improvement over the tracking camera system. While the camera is still tracking the character, some of its parameters, such as its orientation or distance to the character, can be changed. On video game consoles, the camera is often controlled by an analog stick to provide a good accuracy, whereas on PC games it is usually controlled by the mouse. This is the case in games such as Super Mario Sunshine or The Legend of Zelda: The Wind Waker. Fully interactive camera systems are often difficult to implement in the right way. Thus GameSpot argues that much of the Super Mario Sunshine' difficulty comes from having to control the camera. The Legend of Zelda: The Wind Waker was more successful at it - IGN called the camera system "so smart that it rarely needs manual correction". One of the first games to offer an interactive camera system was Super Mario 64. The game had two types of camera systems between which the player could switch at any time. The first one was a standard tracking camera system except that it was partly driven by artificial intelligence. Indeed, the system was "aware" of the structure of the level and therefore could anticipate certain shots. For example, in the first level, when the path to the hill is about to turn left, the camera automatically starts looking towards the left too, thus anticipating the player's movements. The second type allows the player to control the camera relatively to Mario's position. By pressing on the left or right buttons, the camera rotates around Mario, while pressing up or down moves the camera closer or away from Mario. There is a large body of research on how to implement a camera system. The role of a constraint solver software is to generate the best possible shot given a set of visual constraints. In other words, the constraint solver is given a requested shot composition such as "show this character and ensure that he covers at least 30 percent of the screen space". The solver will then use various methods to try creating a shot that would satisfy this request. Once a suitable shot is found, the solver outputs the coordinates and rotation of the camera, which can then be used by the graphic engine renderer to display the view. In some camera systems, if no solution can be found, constraints are relaxed. For example, if the solver cannot generate a shot where the character occupies 30 percent of the screen space, it might ignore the screen space constraint and simply ensure that the character is visible at all. Such methods include zooming out. Some camera systems use predefined scripts to decide how to select the current shot for commonly seen shot scenarios called film idioms. Typically, the script is going to be triggered as a result of an action. For instance, when the player's character initiates a conversation with another character, the "conversation" script is going to be triggered. This script will contain instructions on how to "shoot" a two-character conversation. Thus the shots will be a combination of, for instance, over the shoulder shots and close-up shots. Such script-based approaches may switch the camera between a set of predefined cameras or rely on a constraint solver to generate the camera coordinates to account for variability in scene layout. This scripted approach and the use of a constraint solver to compute virtual cameras was first proposed by Drucker. Subsequent research demonstrated how a script-based system could automatically switch cameras to view conversations between avatars in a realtime chat application. Bill Tomlinson used a more original approach to the problem. He devised a system in which the camera is an autonomous agent with its own personality. The style of the shots and their rhythm will be affected by its mood. Thus a happy camera will "cut more frequently, spend more time in close-up shots, move with a bouncy, swooping motion, and brightly illuminate the scene". While much of the prior work in automated virtual camera control systems has been directed towards reducing the need for a human to manually control the camera, the Director's Lens solution computes and proposes a palette of suggested virtual camera shots leaving the human operator to make the creative shot selection. In computing subsequent suggested virtual camera shots, the system analyzes the visual compositions and editing patterns of prior recorded shots to compute suggested camera shots that conform to continuity conventions such as not crossing the line of action, match placement of virtual characters so they appear to look at one another across cuts, and favors those shots which the human operator had previously used in sequence. In 2010, the Kinect was released by Microsoft as a 3D scanner/webcam hybrid peripheral device which provides full-body detection of Xbox 360 players and hands-free control of the user interfaces of video games and other software on the console. This was later modified by Oliver Kreylos of University of California, Davis in a series of YouTube videos which showed him combining the Kinect with a PC-based virtual camera. Because the Kinect is capable of detecting a full range of depth (through computer stereo vision and Structured light) within a captured scene, Kreylos demonstrated the capacity of the Kinect and the virtual camera to allow free-viewpoint navigation of the range of depth, although the camera could only allow a video capture of the scene as shown to the front of the Kinect, resulting in fields of black, empty space where the camera was unable to capture video within the field of depth. Later, Kreylos demonstrated a further elaboration on the modification by combining the video streams of two Kinects in order to further enhance the video capture within the view of the virtual camera. Kreylos' developments using the Kinect were covered among the works of others in the Kinect hacking and homebrew community in a New York Times article. Virtual cameras have been developed which allow a director to film motion capture and view the digital characters movements in real time in a pre-constructed digital environment, such as a house or spaceship. Resident Evil 5 was the first video game to use the technology, which was developed for the 2009 film Avatar. The use of motion capture to control the position and orientation of a virtual camera enables the operator to intuitively move and aim the virtual camera by simply walking about and turning the virtual camera rig. A virtual camera rig consists of a portable monitor or tablet device, motion sensors, optional support framework, and optional joystick or button controls that are commonly used to start or stop recording and adjust lens properties. In 1992, Michael McKenna of MIT's Media Lab demonstrated the earliest documented virtual camera rig when he fixed a Polhemus magnetic motion sensor and a 3.2 inch portable LCD TV to a wooden ruler. The Walkthrough Project at the University of North Carolina at Chapel Hill produced a number of physical input devices for virtual camera view control including dual three-axis joysticks and a billiard-ball shaped prop known as the UNC Eyeball that featured an embedded six-degree of freedom motion tracker and a digital button. ^ a b Rollings, Andrew; Ernest Adams (2006). Fundamentals of Game Design. Prentice Hall. ISBN 9780131687479. ^ Casamassina, Matt. "fixed-camera". giantbomb. ^ Casamassina, Matt. "Resident Evil Review". IGN. Retrieved 2009-03-22. ^ "Sonic Adventure Review". IGN. Archived from the original on 2008-02-11. Retrieved 2009-03-22. ^ "Tomb Raider: The Last Revelation Review". IGN. Retrieved 2009-03-22. ^ Carle, Chris. "Enter the Matrix Review". IGN. Retrieved 2009-03-22. ^ Gerstmann, Jeff (2002-10-04). "Super Mario Sunshine Review for GameCube". GameSpot. Retrieved 2009-03-22. ^ Casamassina, Matt (2003-03-25). "The Legend of Zelda: The Wind Waker Review". IGN. Retrieved 2009-03-22. ^ "15 Most Influential Video Games of All Time: Super Mario 64". GameSpot. Retrieved 2009-03-22. ^ "The Essential 50 Part 36: Super Mario 64 from". 1UP.com. Retrieved 2009-03-22. 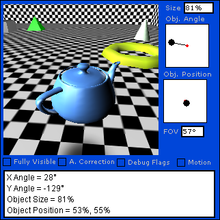 ^ "Cameracontrol.org: The virtual camera control bibliography". Retrieved 6 May 2011. ^ Bares, William; Scott McDermott; Christina Boudreaux; Somying Thainimit (2000). "Virtual 3D camera composition from frame constraints" (PDF). International Multimedia Conference. California, United States: Marina del Rey: 177–186. Retrieved 2009-03-22. ^ Drucker, Steven M.; David Zeltzer (1995). CamDroid: A System for Implementing Intelligent Camera Control (PDF). Symposium on Interactive 3D Graphics. ISBN 978-0-89791-736-0. Retrieved 2009-03-22. ^ Drucker, Steven M.; David Zeltzer (1995). CamDroid: A System for Implementing Intelligent Camera Control (PDF). Symposium on Interactive 3D Graphics. ISBN 978-0-89791-736-0. Retrieved 2015-03-15. ^ He, Li-wei; Michael F. Cohen; David H. Salesin (1996). "The Virtual Cinematographer: A Paradigm for Automatic Real-Time Camera Control and Directing" (PDF). International Conference on Computer Graphics and Interactive Techniques. New York. 23rd: 217–224. Retrieved 2009-03-22. ^ Tomlinson, Bill; Bruce Blumberg; Delphine Nain (2000). Expressive Autonomous Cinematography for Interactive Virtual Environments (PDF). Proceedings of the Fourth International Conference on Autonomous Agents. 4th. Barcelona, Spain. CiteSeerX 10.1.1.19.7502. doi:10.1145/336595.337513. ISBN 978-1-58113-230-4. Retrieved 2009-03-22. ^ Lino, Christophe; Marc Christie; Roberto Ranon; William Bares (Nov 28 – Dec 1, 2011). The director's lens: an intelligent assistant for virtual cinematography. Proceedings of the 19th ACM International Conference on Multimedia (MM '11). ACM. pp. 323–332. doi:10.1145/2072298.2072341. ISBN 9781450306164. ^ Kevin Parrish (November 17, 2010). "Kinect Used As 3D Video Capture Tool". Tom's Hardware. ^ Tim Stevens (Nov 29, 2010). "Two Kinects join forces to create better 3D video, blow our minds (video)". Engadget. ^ Jenna Wortham (November 21, 2010). "With Kinect Controller, Hackers Take Liberties". New York Times. ^ Hsu, Jeremy (27 February 2009). ""Virtual Camera" Captures Actors' Movements for Resident Evil 5". Popular Science. Archived from the original on 2 March 2009. ^ a b Lewinski, John Scott (27 February 2009). "Resident Evil 5 Offers Sneak Peek at Avatar's 'Virtual Camera'". Wired. Retrieved 25 February 2015. ^ Lowe, Scott (27 February 2009). "The Tech Behind RE5". IGN. Retrieved 24 February 2015. ^ Wrenn, Eddie (27 August 2009). "Avatar: How James Cameron's 3D film could change the face of cinema forever". Daily Mail. Retrieved 25 February 2015. ^ Thompson, Anne (1 January 2010). "How James Cameron's Innovative New 3D Tech Created Avatar". Popular Mechanics. Retrieved 25 February 2015. ^ "Optitrack InsightVCS". Retrieved 2015-03-15. ^ Michael McKenna (March 1992). Interactive viewpoint control and three-dimensional operations. Proceedings of the 1992 Symposium on Interactive 3D Graphics (I3D '92). ACM. pp. 53–56. CiteSeerX 10.1.1.132.8599. doi:10.1145/147156.147163. ISBN 978-0897914673. ^ Frederick Brooks, Jr. (June 1992). "Final Technical Report – Walkthrough Project" (PDF). Tr92-026. University of North Carolina at Chapel Hill. Retrieved 2015-03-23.